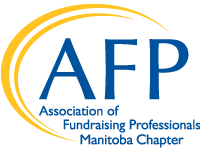 Members of AFP Manitoba are eligible for a variety of grants and scholarships supporting professional development, education and networking opportunities with fellow AFP chapters and fundraising experts from around the world. All members in good standing are eligible for grants through AFP Manitoba, the AFP Foundation for Philanthropy - Canada, and AFP Global. Questions? Contact AFP Manitoba's Awards and Scholarship Chair Pam Simmons. This scholarship is valued at $500. Applicants must work for organizations with less than $1 million dollars in the fiscal year previous to application. Every year AFP Manitoba grants $1,000 for education opportunities for multiple applicants. This scholarship is valued at $500. Spring deadline is March 30, 2019. Fall deadline is September 30, 2019. Spring 2019 intake for registration to the 2020 AFP ICON, must be a first-time attendee! The value of this scholarship is the registration fee less a $10 administration fee (CAN), plus a matching grant from AFP Manitoba for $500 in travel costs. Download the fillable word format APPLICATION FORM, save to your computer, then send the completed form to afpmanitobaawards@gmail.com. Find out more about AFP's Foundation for Philanthropy. The goal of this program is to build the capacity of emerging fundraising leaders that reflect the diversity of our communities. This highly effective program provides dedicated education, professional development and mentorship to 20 mid-level and emerging non-profit professionals from across Canada, representing a wide range of cultural backgrounds and interests. AFP is pleased to offer $1,500 ($USD) scholarships to attend the AFP International Fundraising Conference for each of the currently identified AFP diverse communities. These include visible minorities (Black, Hispanic & Asian), People with Disabilities, Faith-based, LGBTQ, Jewish, Rural, or another underrepresented community. Application process open September 1 - October 30. To learn more about this program including application criteria and deadlines, please visit AFP Global's website. The AFP Foundation for Philanthropy—Canada offers Canadian fundraising professionals working for charitable and non-profit organizations the opportunity to develop their knowledge and skills in fundraising. Financial scholarships, up to a maximum of $1000, are being offered to cover registration and travel costs for educational programs at the local, national and/or international level.